It might be difficult to imagine, in times such as these, that a radical, agitating vocal advocate for revolution could thrive in the United States — much less in a place like Carmel. Lincoln Steffens and his scandalously young wife, wild-eyed radicals both, crashed the neighborhood in the mid-1920s, just as the city was recovering from the libertine antics of Bohemians like poet George Sterling and Jack London. Carmel was settling down, but now the famous muckraker came to town with revolution and reform on his mind. The story of his life in Carmel is an example of how neighbors with wildly different approaches to politics and the social construct can still develop abiding friendships if they spend the time to actually know one another. This all happened decades ago, but Steffens in Carmel is an inspiration for today’s divided society. Steffens was a California native, born in San Francisco. He died in Carmel at the age of 70, in 1936. In between, he was a writer and a journalist who asked impertinent questions and reached insolent conclusions. He knew and chatted with the giants of his time, including Teddy Roosevelt, J.P. Morgan, Clarence Darrow, Lenin and Mussolini. He lived now and again in Europe, and he witnessed revolutions in Russia and Mexico. He got involved in labor wars wherever he could, including one in Los Angeles — where some alleged he had been too involved in the defense of domestic terrorists. As a reporter, his beat was greed, corruption and institutional dysfunction. His seminal book, The Shame of the Cities, was a collection of articles he wrote for McClure’s magazine, which he edited. His collective work is a pioneering example that activist, investigative journalism can result in great civic and social change. And yet, behind all that hell-raising, Steffens’ gregarious spirit won friends wherever he went, from Wall Street to the county jails, even as he was regarded as a Satan across the land. 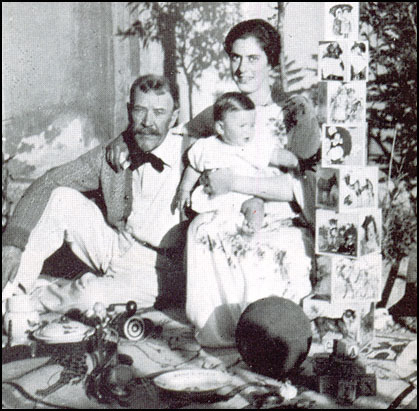 Lincoln Steffens landed in Carmel at the age of 60 with his wife, Ella Winter, who was a 26-year-old socialist writer when they married three years earlier, in 1924. During their first two years of marriage, they lived in San Remo and had a son they named Pete. In Carmel, Steffens could settle into domestic life with his first and only child. The Steffens found an “indigenous-looking wooden house on the corner of Ocean Avenue and San Antonio Street, about a hundred yards from the beach,” according to a biographer, Justin Kaplan. The Steffens referred to the house as The Getaway. Steffens’ reputation as a firebrand preceded him; by then he had witnessed and reported on a lifetime of corruption and revolution across the planet. He had also been a presence in Carmel some years earlier, when Bohemian culture was ripe and loopy. Rumor had it that he and the novelist and playwright Mary Austin were romantically entangled. Austin, a rather large and larger-than-life presence in Carmel, wore long priestess robes and was given to meditating in a tree house. But now, two decades later, he and Ella were hunkered down to raise Pete, while Steffens wrote his autobiography in the twilight of his life. Steffens was not about to retire quietly. Where once he had been a furious citizen of the world, he now brought that intensity to the affairs of Carmel. He delved into politics and the operations of the schools. He and Ella started a weekly newspaper they called The Carmelite, which operated in direct competition to The Pine Cone, then the stodgy defender of the status quo. 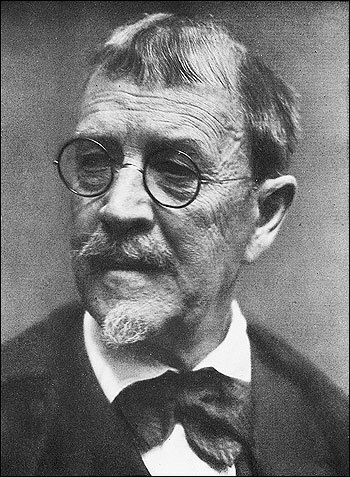 Lincoln Steffens was constantly quarreling with The Pine Cone, which referred to The Carmelite and its staff variously as reds, Bolsheviks and pro-German socialists. Steffens himself noted that Carmel had become a thriving community of plutocrats, socialites, sportsmen, comfortably retired geriatrics and others who had “died and gone to heaven.” He might have been speaking of himself. 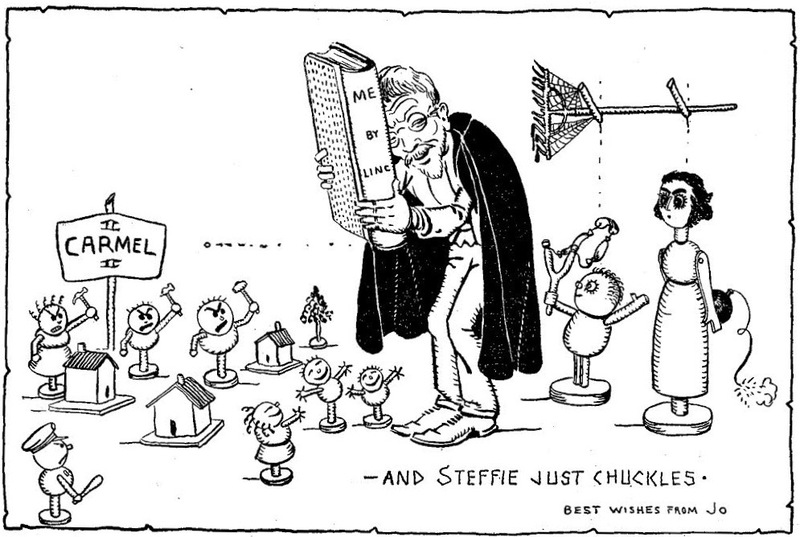 And then, in June of 1929, word spread around Carmel that Ella had left Steffens. She sued for divorce, alleging extreme cruelty. The New York Times picked up the story and it was the talk of Carmel. Ella fled to England with their son. But, as sometimes happens, Lincoln and Ella remained friendly. They exchanged long-distance correspondence. Love letters, actually. And she returned to the United States in October, the day the banks crashed, and they remained together until he died, even after the final divorce decree was granted in 1931. Through it all, and even before his marriage to Ella and while he had been married to his first wife, Josephine, Steffens “carried on a quasi-engagement and then a quasi-marriage with Gussie Burgess,” according to Thomas Leonard, who wrote the foreword in the 2005 reprint of Steffens’ autobiography. Steffens’ love life seemed to have been a succession of intense, confusing and awkward encounters, including his relationship with Mary Austin, who apparently ended up stalking him across the country. He had earlier been married to the tragically un-functional Josephine, and Gussie seemed to remain fixed in his orbit. But now Ella was back. Their marriage dissolved, yet they still lived together. It was all quite mysterious, and Lincoln gleefully played up the mystery. Ella was in on the game. Were they living in sin? Or merely in Carmel? The Autobiography of Lincoln Steffens was published in 1931. Salesmen for the publisher, Harcourt, Brace, grumbled because the book was too thick and too expensive — $7.50 when times were tough. Most people hadn’t heard of him, or they had forgotten who Steffens was. He hadn’t been living in New York City for years by then, and the West Coast was regarded as a cultural wasteland. The good people whom I have found to be ‘no good,’ who carry through no reforms, who oppose all change as soon as they understand it — these, the great obstacle to all progress, whose incomes are a wasteful graft on business, in which they are a useless hindrance, whose ‘moral’ influence in art, literature, education, cultural, and business is as ‘bad’ as it is in politics, these people are doomed outside as they are in — Russia. It was an odd position to be in; the story he wrote about his own life became more impactful than anything he had done in that life. His renewed celebrity was much noticed in Carmel, which embraced him now as a native son. At one point at the Carmel Public Library, 36 people were on the waiting list for Autobiography. Then, oddly, The Carmel Pine Cone, the stodgy weekly and the Steffens’ foe, devoted an entire edition in praise of him. The newspaper feud was now behind them, it seemed, perhaps owing to the fact that Steffens had been in ill health. The Carmelite no longer existed, but Steffens and Ella edited other local weeklies, Controversy, followed by Pacific Weekly. The tribute edition, which included a succession of praises, acclaim, compliments and good cheer written by dozens of Carmel citizens, reads almost like eulogies, as if the people in town wanted Steffens to read his own flattering obituary and the nice things they remembered of him. And yet The Pine Cone opened its pages to like-minded agitators, along with staid and conservative townsfolk, all unanimous in their embrace of Steffens, in its Feb. 16, 1934 tribute edition. Somehow Steffens had offended almost everyone in town, but they loved him anyway. In summer of 1936, Steffens’ health got bad. He was diagnosed with arteriosclerosis, but he refused to leave the Getaway. He reportedly told his doctor that he’d “rather die sooner than leave my home.” Steffens died of a heart attack at The Getaway on Aug. 9, 1936, some 17 months after the special edition.